The following are notes on a recent meeting regarding SCOLAR. Here are some useful links: SCOLAR on T&L Web, there is also a powerpoint slide that highlights the features. Shows student numbers not names at the moment. Feedback and marks can be added by the tutor. Students see marks after the moderator agrees. 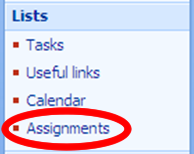 Student view – will have ‘upload assignment’ – with declaration of own work. Resubmitted files will replace the existing file even if it has a different file name. Students can only submit one file (so zip maybe necessary for multiples). Schools to decide if this option/facility is used. Automation of assignment for multiple markers. Printing of documents – who pays? - the intention is to keep it all online (Faculty/School/individual can decide if they wish to implement).